Virtualization is big news for small and medium sized businesses - it enables them to do much more work with much less kit by running multiple operating systems on a single sever. That's good news for a range of reasons - reducing carbon footprint, improving IT efficiency and saving piles of cash. 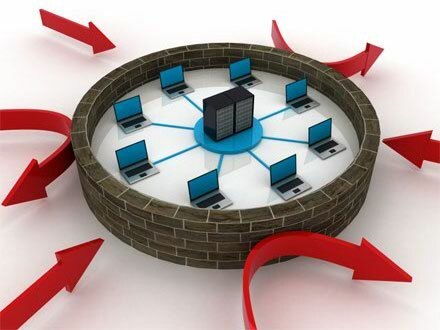 But it seems that many businesses aren't protecting their virtualized systems. So how can you keep yours safe? Security firm Symantec surveyed nearly 700 companies in 28 different countries, discovering firms investing in virtualization weren't taking simple steps to protect their data. Just 15% were backing up data used in their virtual environments, and an incredible 80% weren't protecting their virtual environments with anti-virus software. That's an incredibly risky approach, especially when securing your sever is so simple. From the smallest start-up to the biggest agency, Dell has the security solutions to keep your stuff safe. Dell has created four kinds of security solutions, security services, which provide a comprehensive range of monitoring, management and security consulting services, network security, which protects your business not just from malware such as viruses and worms but also from intruders and even spam; endpoint security, which protects the data on PCs, notebooks, servers and mobile devices and data security, which enables you to protect sensitive data from prying eyes, digital disasters and good old-fashioned human error. Protecting your network from intrusion is easier than you might think Appliances such as the Dell PowerConnect J-SRX series provide world-class firewall protection and IP Security (IPsec) virtual private networking technologies. Easy, quick and secure to deploy, the J-SRX Series offers superb intrusion protection, antivirus protection, anti-spam screening and even web content filtering. Dell also provides tools to protect individual devices - systems with Intel® vPro ™ processor technology can automatically stop viruses from spreading, ensure secure data storage and receive security updates even when PCs are off Remote diagnostics and repairs, asset inventory and zero touch configuration enable you to deploy, manage and update vPro systems from your desk. Trend Micro Worry-Free Business Security Services can be preinstalled on Dell systems to protect against malicious software and mail, restrict users' access to sites, and provide continuous protection for your mobile workforce - without requiring dedicated hardware or IT staff. For larger networks, the Dell KACE K1000 Management Appliance offers even more powerful security, including quarantining compromised devices, automatic software patch management for Windows and Mac OS X operating systems and applications, vulnerability scanning and secure web browsing. Dell also provides networked storage to ensure every digital asset is archived. Solutions such as Dell PowerVault RD1000 removable disk storage offer low-cost, rock-solid, super-speedy backup, while larger organizations can benefit from the sever-connected PowerVault MD3220 storage array's incredible scalability, supporting up to 96 additional drives between up to four servers. By protecting your data and systems, by ensuring things run 24/7, by patching software vulnerabilities, enforcing policies and helping you comply with data protection legislation. Dell's solutions can save you time, effort and money. Dell servers work as hard as you do. They work with leading Independent Software Vendors (ISVs) to deliver unrivalled performance and reliability, and their PowerEdge tower servers and rack servers are built for demanding jobs in creative, engineering and architectural design, web design and development, photo editing, finance and product design. With the latest technology in their scalable servers and storage solutions, Dell is the one-source partner to match your IT ambitions.